Hungarian geographer and ethnologist; born at Cece, Hungary, May 15, 1853; educated at Fehervar and Budapest; in the latter city he frequented the military academy, subsequently being attached to the staff of Field-Marshal Ghyczy. 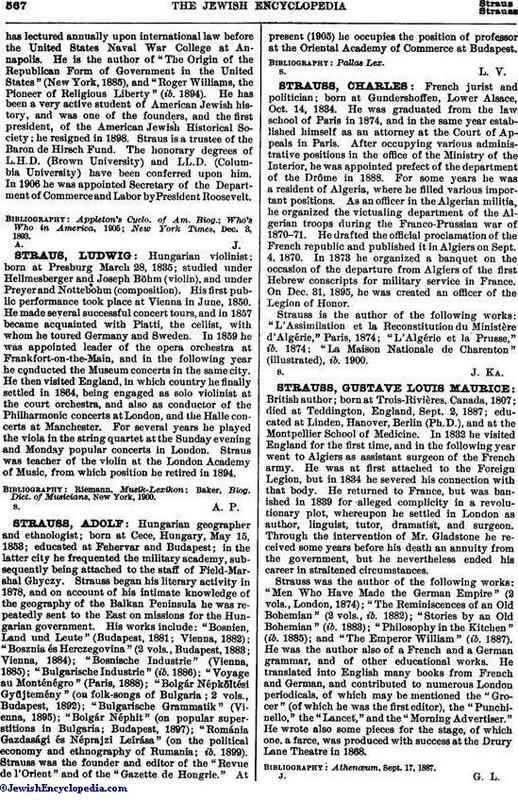 Strauss began his literary activity in 1878, and on account of his intimate knowledge of the geography of the Balkan Peninsula he was repeatedly sent to the East on missions for the Hungarian government. His works include: "Bosnien, Land und Leute" (Budapest, 1881; Vienna, 1882); "Bosznia és Herezegovina" (2 vols., Budapest, 1883; Vienna, 1884); "Bosnische Industrie" (Vienna, 1885); "Bulgarische Industrie" (ib. 1886); "Voyage au Monténégro" (Paris, 1888); "Bolgár Népköltési Gyüjtemény" (on folk-songs of Bulgaria; 2 vols., Budapest, 1892); "Bulgarische Grammatik" (Vienna, 1895); "Bolgár Néphit" (on popular superstitions in Bulgaria; Budapest, 1897); "Románia Gazdasági és Néprajzi Léirása" (on the political economy and ethnography of Rumania; ib. 1899). Strauss was the founder and editor of the "Revue de l'Orient" and of the "Gazette de Hongrie." At present (1905) he occupies the position of professor at the Oriental Academy of Commerce at Budapest.